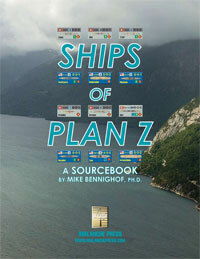 In January 1939, Germany’s Supreme Leader approved a naval expansion program known as Plan Z. It included battleships, aircraft carriers, cruisers and smaller craft as well. We added these ships to our Second World War at Sea series in the massive Plan Z expansion set. Ships of Plan Z is a sourcebook describing these ships as well as those that Britain’s Royal Navy would likely have built in response. And it has additional pieces of its own: “long” ship pieces for those that appear in other Second World War at Sea games on smaller, square pieces. You don’t have to have these pieces to play the games, but if you’re a hard-core naval gamer, then you know you have to have these pieces. There are 105 new pieces included, most of them German torpedo boats (small destroyers in German parlance) plus anti-aircraft ships, gunboats and a flight-deck cruiser. The pieces are mounted and die-cut, the same type of wonderful silky-smooth pieces with minimal die-strike markings found in Plan Z.
Click here to order this great title right now!